﻿ Warehouse Safety Sensor Systems: Which Fits Your Needs? Blog Home > AisleCop > Warehouse Safety Sensor Systems: Which Fits Your Needs? 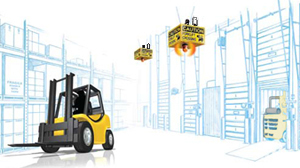 Automated safety sensors warn pedestrians and forklift drivers to help prevent collisions, but which is right for you? Safety sensors come in many varieties and serve varied functions from detecting warm bodies to reacting to mass proximity. They detect motion, infrared light wavelengths, heat signals and more. But how do you know which system you need? Look at potential for injury or damages at intersections, in aisles, at dock doors, personnel entrances and other locations where machinery and man mix. As you make your list of possible improvements, you will begin to see what devices will best correct the danger potential, such as safety gates, flashing lights, and sensors. You can then look into the effectiveness and cost of such enhancements, and, the potential cost of not making a change. Sensors take safety and make it an active process rather than passive such as using mirrors, tape, and other measures. With sensors detecting the potential for danger, there is an active response such as gates closing, lights flashing or sirens going off – and it all happens automatically. 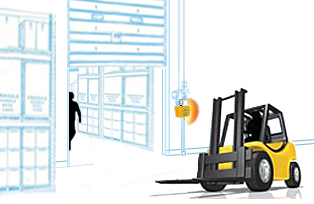 Gate systems detect the presence of traffic (motion) in the targeted area and open or close gates to allow access to either pedestrians or forklifts, depending on how the system is set up. Some gate systems include special barriers with flashing lights for both traffic directions, others simply warn of crossing traffic with flashing lights and no deterrence, with many variations in between. There are many ways to protect against accidents in storage rack areas. Most of these sensor systems rely on motion or thermal/infrared detection technology. Sensors can be placed at the ends of rack aisles to warn of motion within the aisle and/or motion crossing the end of the aisle. Sensors can also be placed at important intersections where people and machines cross paths. All these systems generally use flashing lights as their warning mechanisms. Some also have audible sirens. Dock doors are perhaps the most dangerous location in a facility simply for the fact that forklifts can drop over the dock edge with catastrophic consequences. Protection from these types of accidents is best accomplished with a combination of training and devices like traffic lights showing when a truck is at the dock, and sensor systems to warn of traffic in the area. These sensors rely on motion detection and will display flashing lights when traffic is detected. 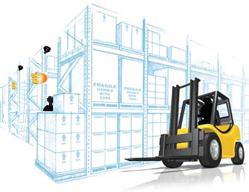 Additional safety factors help by using door guards and dock gates to assure the dock is not open to forklifts until a truck is in place. 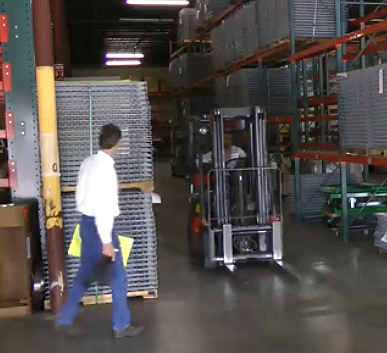 There are often intersections within a warehouse complex where there are blind corners and the potential for pedestrian and forklift or forklift to forklift collisions to occur. These are the places where proximity detection can be very important. Just how close is the oncoming traffic, and is it massive like a forklift, or smaller like a human? Depending on the sensor system you select, you can select the way you want the intersection to be handled. You can choose for all directions to be warned, for only forklift traffic to be detected, or for only pedestrian traffic to be detected. It all depends on the intersection and your assessment of traffic priority in your safety program. Is your safety program effective? No matter how many sensors you have or bright lights flashing, safety will not improve unless your safety systems make sense, are consistent in how they are set up, and appropriate signage is in place. Even then, you should follow up with regular safety training for all employees and visitors. The people in your plant need to know what all those sensors are trying to tell them.